So you want to take good care of your precious stamp collection and ensure that it stays in top notch condition for a long time? Without a doubt, the best storage solution is a stamp album. With all the options on the market, it can be difficult to decide which one to get. For the serious collector of Canada stamps, Arpin Philately recommends the Lighthouse Hingeless Canada stamp album–a stamp album fit for the Queen herself!! While it is true that the Lighthouse album represents a serious investment, it’s not without good reason. This beautiful and luxurious stamp album is truly high class! The manufacturers of this album know that it is meant for long-term stamp protection and they have excelled in its workmanship and design. These albums will stand the test of time and can even be passed on to future generations. 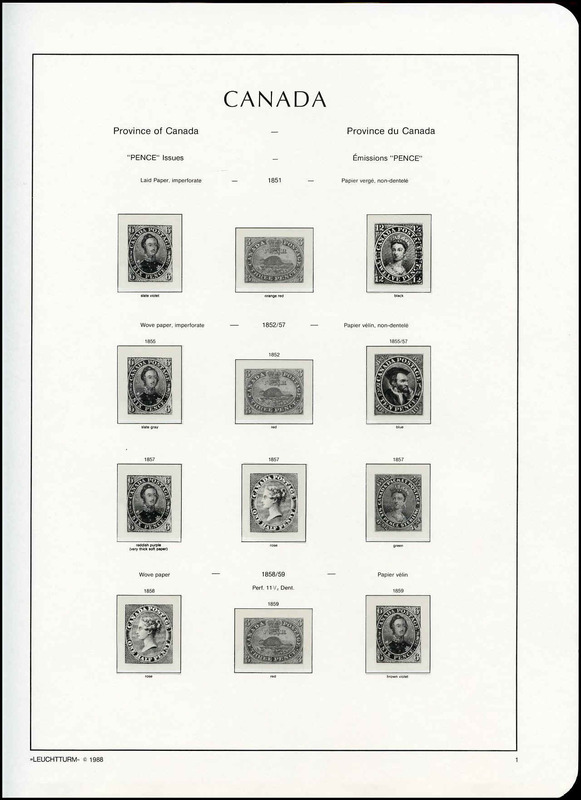 Here are some of the outstanding features of the Lighthouse Hingeless Canada stamp album…. BINDER: It features a high quality padded binder in textured leatherette. The Canada album is in an attractive red color. Each binder also comes with its own slipcase, ensuring your pages will stay neat even when the binder is upright in your bookcase. The 2-Post Turn Bar binder mechanism greatly facilitates the adding and removing of pages. Plus, each binder has «Canada» embossed in gold on its spine, allowing for easy identification of the country you’re collecting, as well as adding to the snazzy look. PAGES: The pages are made of superior card-stock that is pH-neutral (acid-free) and wood fiber free. This means your pages won’t age or yellow over the years. Each page is obviously perforated to fit the Turn Bar system, but also possesses special elongated perforations running down the inside edge of the paper to make sure that your sheets stay flat even when the binder is open. The heavy feel of these pages automatically gives the album a superior feel. MOUNTS: The Lighthouse album is hingeless, so individual pages come with pre-affixed mounts that you can slip your stamps into. Each mount is top-mounting and is sealed at the bottom to ensure your stamps stay put. The chemical-free, clear mounts are made of a non-reflective material which guarantees easy viewing and also protects your stamps from dust and damp. PRINTING QUALITY: Where this album really excels is in the quality of its printed pages. No fuzzy edges here! You’ll enjoy high-resolution printed characters and images. Each stamp is printed in black on white behind its corresponding clear mount, enabling you to clearly see which stamps are still missing from your album. In addition to stamp images, this album also includes philatelic and technical notes and pre-printed sheets identifying watermarks, printing, paper, color, type and perforation differences of different stamps. Officials and Back of Book issues are also listed. What else can we say? If you want a durable, attractive and high quality stamp album, look no further than the Lighthouse Hingeless Canada stamp album. You’ll never regret your investment! UPDATE: How to remove self-adhesive stamps from a paper backing? FAQ-What is a die-cut stamp?